Villa Palagonia performed in November 2017 at the NIAF Annual Gala “Expo Italiana.” NIAF is the National Italian American Foundation, which celebrated the region of Sicily during the festive weekend. Villa Palagonia has set out on the “Left Bank,” as we like to call our new home in Englewood, New Jersey. We are thrilled to join many of our friends on the west side of the Hudson, yet still remaining true to our New York City roots with frequent visits for work and play in the City. As we settle in to our new headquarters, we are purposefully keeping our schedule less demanding for a few months, but we are certainly keeping our toes in the action. We have a few appearances in spring 2018, that we hope you’ll join us for! In early March we’ll be on Hootenanny Cafe. You can tune in to hear a set of Villa Palagonia on the radio! Where: WTBQ or at TuneIn Radio. Mid-March, we’ll be getting you all singing for St. Joseph’s Day at Cacio e Vino with Experience Sicily. The afternoon, which features a traditional Saint Joseph’s Day Sicilian feast, will be great fun. Reserve your spot at Eventbrite! In April, we’ll be in northern Connecticut for a full concert at the Sounding Board Coffeehouse. Contact the College Club of Northern New Jersey about attending at ccpresident@gmail.com. A World of Women’s Voices is a powerful, unique, collaborative performance featuring three artists — Sharon Goldman, Bev Grant and duo Villa Palagonia — who celebrate the power of women’s stories from around the world, from Italian folk tales and biblical stories to African women, New York immigrant history (including the Triangle Fire), personal/childhood narratives and labor movement anthems. We are offered an enriching personal and community experience not only through the stories told in the songs — which the artists knit together by illustrating how, even with our different backgrounds, we all are essentially connected — but also through encouraging us to sing and, in some cases, dance along! On Sunday, June 24 we’ll be live on Hootenanny Cafe. You can tune in to hear an entire broadcast co-hosted by Villa Palagonia with in-studio performances. Hello Friends! Just in time for the NERFA Conference, we’re releasing our latest video “Mi Votu e Mirivotu (I Turn and Turn Again),” filmed by World One Video’s JB Nuttle. Based on a beloved Sicilian folk song, we’ve arranged our own interpretation and written English lyrics in the spirit of the original song. Meanwhile, Villa Palagonia will be showcasing “I Turn and Turn Again” at the NERFA (North East Region Folk Alliance) Conference on Thursday night in Stamford, CT. Please join us! Enjoy these two latest videos from Villa Palagonia! Recorded by World One Video. After a spring presenting “A World of Women’s Voices” with Sharon Goldman and Bev Grant, we’ve been working on some videos so you can hear and see our performances–unedited! They will be released one at a time over the next few weeks to keep you wanting more. This July, we’re touring Sicily! We’re playing with local musicians and doing some guerrilla performances along the way as we start to plan our next recording project and write new songs. So, like the cricket, this summer we are enjoying the sun and singing and playing for fun–exploring … so that in the winter, we are ready to entertain you with the warmth we’ll have collected here in Sicily, this July. Villa Palagonia in duo form headed to Maryland earlier this month to record a series of videos for your viewing pleasure. Please enjoy “Marco the Barber” recorded by JB Nuttle of World One Video. We will be releasing the videos throughout the next few weeks. Let us know what you think! We’re very much looking forward to sharing On Your Radar with John Platt of WFUV with Sonya Heller and Jay Hitt! We hope you’ll come along for the ride with us! Join Villa Palagonia for the Feast of Santa Lucia! 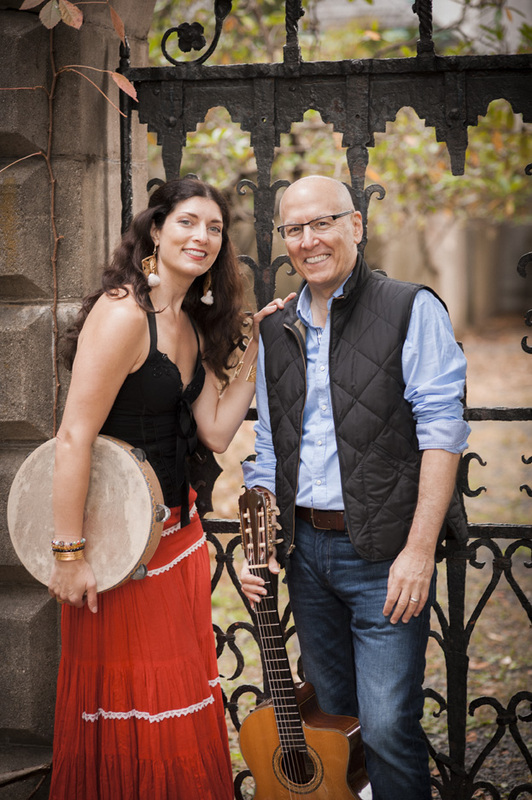 Sunday, December 13 from 3 PM to 6 PM at Eolo Seasonal Sicilian Kitchen, we’ll be celebrating the patron saint of eyes, sights, light, and wheat with a concert featuring music from our new album, Rhythms & Roots, along with a few seasonal favorites. We’ll have a few pre-release copies of Rhythms & Roots available for purchase for your holiday gift shopping. When: Sunday, December 13, 3 p.m. to 6 p.m. Learn more details about the feast at Experience Sicily.com. 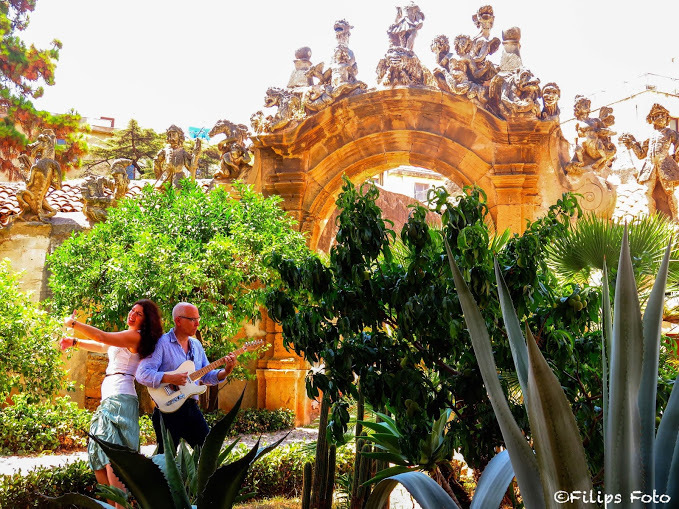 In July, Villa Palagonia, the music duo, visited Villa Palagonia, the estate in Bagheria, Palermo Province, in Sicily. 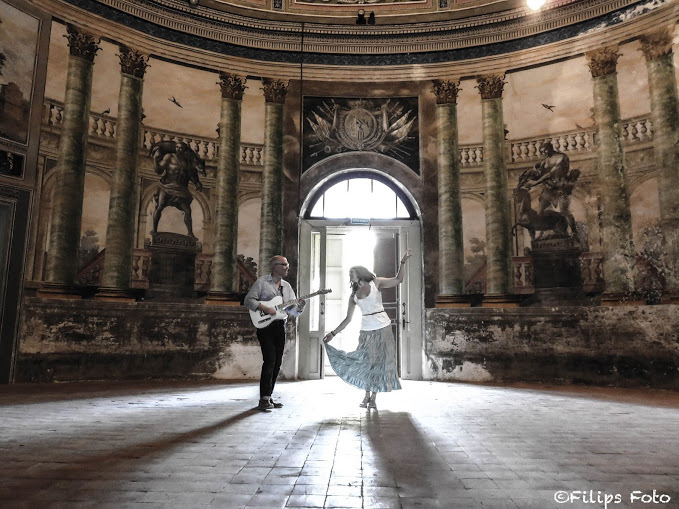 Allison’s cousin, Filippo Buttitta took some beautiful photos of us being inspired by the “Villa of the Monsters.” As we finish our debut album, “Rhythms & Roots,” we were thrilled to have had the opportunity to return to the place that represents the roots of our musical concepts. There are more photos where these came from! These are just two of many that we’re ready to share right now. Join us on the journey to complete “Rhythms & Roots.” We’ll be launching a pre-sale campaign in the weeks ahead. Sign our mailing list on the Contact page. Here’s another photo, from the interior of Villa Palagonia.